It’s the totality of the experience by which Whiskey Tango Foxtrot squeaks into a mild recommendation. Whiskey Tango Foxtrot is based on the real life experiences of Kim Barker, who, in 2003-2006, worked as a journalist covering the harsh political and geographical landscape of Afghanistan. She went on to write a memoir entitled The Taliban Shuffle: Strange Days in Afghanistan and Pakistan, which serves as the movie’s source material. Such a situation is fertile ground for interesting stories and WTF (“Whiskey Tango Foxtrot” is a military euphemism for a very common – albeit crude – phrase) does a fair job of mining the territory. However, even with Tina Fey (comedienne extraordinaire, author and Saturday Night Live alumna), it’s not a slam dunk. There’s nothing particularly shocking or revelatory here, but the cumulative effect leads to a solid conclusion and an unexpected outlook for the future. The first act at times struggles to find the right tone and character balance, and at its worst it feels like it’s going to careen into sappy Eat Pray Love territory. Kim’s relationship with her boyfriend falters with the long distance and spotty communications and it comes crashing down altogether when she spots another (semi-naked) woman in the background of her boyfriend’s webcam. From there, Kim finds liberation (in, of all places, a remarkably oppressed environment) and, thankfully, she does so without the saccharine bumper sticker philosophy of Eat Pray Love. The adventure begins with a news bureau meeting of the unmarried, childless staff members. It’s time to ferret out volunteers for a 3-month assignment in Kabul, Afghanistan. Kim recalls riding an exercise bike every single day and at one point she noticed the stationary bike had left an imprint indicating it actually been moving backward on the floor. So emblematic of so much of her life in general. Plus, Kim’s tired of writing news stories for stupid pretty people and she wants a little limelight of her own, so she takes the bait. The first boundary Kim has to contend with is the sexual border between reporters and photographers and soldiers. Kim learns from her new friend, Tanya Vanderpoel (Margot Robbie, The Big Short), that she’s “Kabul cute.” While Kim might rate a 6 or 7 in New York, in Kabul she’s a 9 or 10-ish. And, for the record, that makes Tanya a solid 15. 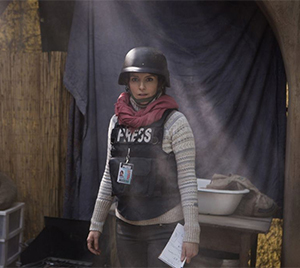 The sexual activities of reporters in high-stress war zones isn’t exactly surprising. Lara Logan, now a 60 Minutes correspondent, made waves by using her sexuality to her advantage and it seems as though the character of Tanya Vanderpoel is modeled after Logan. The screenplay, written by one of Fey’s 30 Rock collaborators, Robert Carlock, plays a little loose with the source material and who’s who in order to spice things up in the typical fashion of creative license. As the story unfolds and the characters settle in, the intensity of the situation comes to the fore and WTF finally hits its stride in the third act. Harassment by soldiers, political leaders and local men would seem to be par for the course, but it’s the culture, the impact of Sharia Law and the strict rules imposed upon women that cast a larger shadow, impacting virtually every aspect of life, including the “dry” restaurants, fashion (which gets a very funny nudge) and education. The movie’s capstone life lesson is upbeat and philosophical – and it comes from an unexpected source. After all Kim goes through – poor translations which further pollute the language barrier, discrimination, wartime violence and politics from all angles – it’s an outlook worth following, even for those of us not experiencing the unreal and the surreal of that war-torn part of the world.